What is new in my collection (April 2015) you can see here. Each picture comes with a description. a. Example of an old fashioned production method: folding. Take a ‘wet’ plate form (± Ø 25 cm) and fold that together. Push firmly on the connecting edges, make a nose and a kind of tail, place ears, legs and finally cut the money slot. You created an old fashioned piggy bank, the so called fish form. This method is rare nowadays because of the labor intensity. 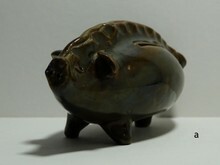 The shown piggy bank is Frisian (form Friesland, the Netherlands). Length 18,5 cm. 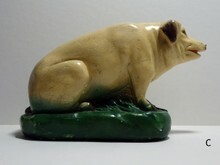 c. French ‘statue’ piggybank. Painted plaster. Antique. Length 21 cm. 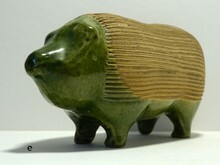 d. Antique piggy bank. 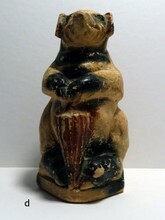 Sitting pig with umbrella. Terra cotta with plaster. It has a certain provenance caused by the scratched inscriptions. High 19 cm. e. French cress piggy. Length 18,5 cm. Unglazed were the cress (or cia) has to grow, the glazed parts keep the water inside the pig shaped container. 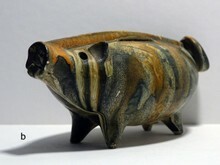 This one is ready made as a pig piggy bank (for coins), most cress pigs have a hole to put the water trough.